Last night was just one of those perfect nights! The fair was going on in full swing and it was just $1 entry fee, so everyone in the city and within a huge radius was there, apparently. We changed our plans and instead of going to the fair ourselves, we hit The Cheesecake Factory and enjoyed a really long, leisurely dinner on the patio, mostly to ourselves. Then we caught a late movie downtown (The Solomon Brothers – it was pretty funny!) and celebrated the fact that the kids were spending the night at Grammy & Papa’s house. 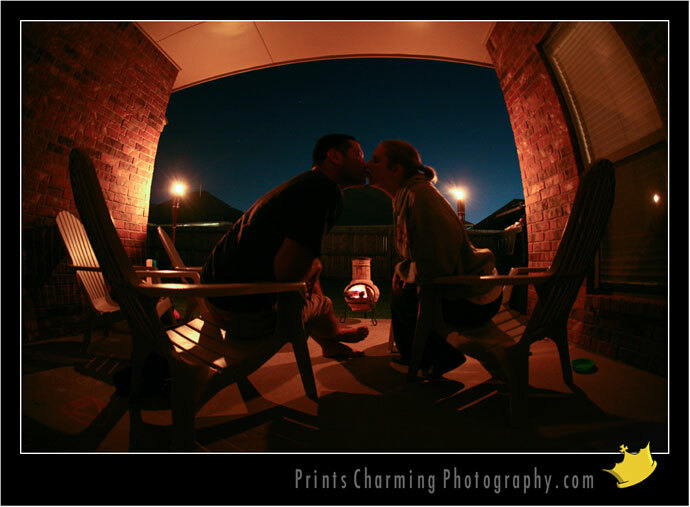 Here’s a fish-eye picture of us on our back porch enjoying the cooler nights that we’ve been having recently. It’s hard to see the stars in this smaller version of the picture, but there’s a lot of detail in the bigger one. We had the Tiki lights burning and a fire in the chimenea. Man, I love the changing seasons!